MERCEDES' Lewis Hamilton has a record pole position in his sights after topping the time sheets at final practice ahead of Saturday's Australian Grand Prix qualifying in Melbourne. The five-time world champion clocked a lap of one minute 22.29 seconds to finish ahead of Ferrari duo Sebastian Vettel and Charles Leclerc in the one-hour session. Australia's Renault star Daniel Ricciardo was 10th fastest in the 20-strong field in the final session before qualifying for the Formula One season-opener. Hamilton appears on track to clinch a record eighth overall pole and sixth straight. He has won two Australian GP titles but has not tasted victory since 2015. The Briton looks set to break his duck after finishing 0.26 of a second ahead of Ferrari threat and four-time world champion Vettel, who has won the past two Australian Grand Prix titles. 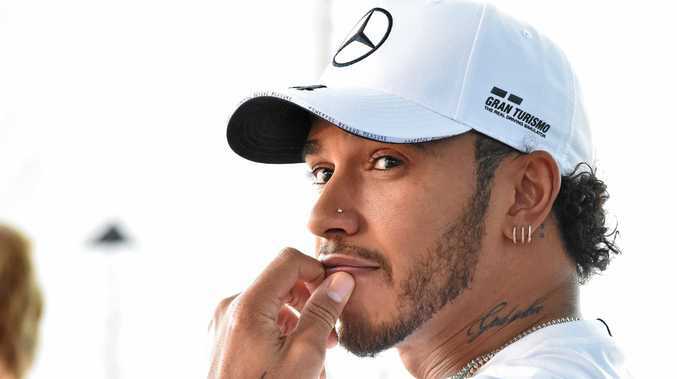 Hamilton didn't enter the Mercedes garage until 15 minutes into final practice after relaxing in the team hospitality suite and did not clock his first lap until halfway through the 60-minute session. But he quickly sounded his intentions by topping the time sheets with his third lap, losing the lead briefly to Vettel and then again stamping his authority. Ferrari will be encouraged by Vettel and Leclerc's resurgence on Saturday after being left in Mercedes' wake on Friday. The Ferrari-powered Haas were also big improvers with Romain Grosjean fourth fastest and Kevin Magnussen fifth. But Ricciardo's former team Red Bull appeared to have plenty of work to do with Pierre Gasly sixth fastest and leading driver Max Verstappen, considered a world title dark horse, back in ninth. "I think they look a bit shaky," retired Australian champion Mark Webber said. "They were trying things with different set-ups overnight and it looks like they are not happy. "Max (Verstappen) is the now the main guy (with Ricciardo defecting to Renault) - he has got to lead." Ricciardo finished one place ahead of his Renault teammate Nico Hulkenberg, who was 11th fastest. There was more misery for the once-mighty Williams team. In his first Formula One round in eight years, Robert Kubica was slowest, more than four seconds adrift of Hamilton, one place behind his rookie teammate George Russell. Kubica bumped into the wall driving into pitlane midway through the session and scattered debris, much to the annoyance of Alfa Romeo driver Kimi Raikkonen, who was trailing behind. Former world champion Raikkonen, formerly of Ferrari, was 17th fastest.